Learn how to run effective split tests. Believe it or not, split testing doesn’t have to be complicated. Download our free ebook and learn how to run split tests that can optimize your email marketing and increase your revenue. Take the guesswork out of email marketing. Use split testing to learn about your audience in a strategic way so you can expand your subscriber list, boost opens and conversions, and optimize your autoresponder series to increase revenue. Design effective split tests that will save time and earn money. Design split tests that optimize your emails, boost opens and conversions and increase revenue. Get examples of split tests you can use right away. 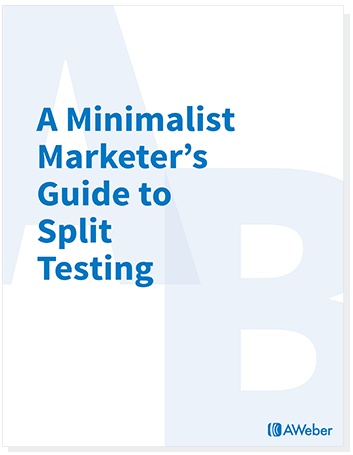 Our ebook is chock full of examples and ideas you can use in your own split testing. Pressed for time? We’ve got you covered. Each chapter includes a “cheat sheet” at the end. You can skip to it for a chapter summary. We’ve divided the guide into a 7-day email series, so you can read it a little bit at a time. Split-testing doesn’t have to give you a splitting headache. We’re going to break it down for you in an easy-to-understand way … and give you examples of split tests you can run right now to optimize your email marketing. Enter your email below to join our free 7-day course and get your free ebook! Are you an AWeber Customer?